Venomous spiders found on the Northern Beaches & Sydney area. A list of Sydney venomous spiders found on the Northern Beaches. Did you know that Sydney’s Northern Beaches is home to some of the most venomous spiders on the planet? But spiders in general tend to get a bad reputation in Australia when the majority of spiders are non-venomous and harmless. However, there are a number of venomous spider species in Sydney you need to be aware of especially if you have small children around in this article we will go over the spiders you need to be aware of and what you can do your self to help prevent them. Did you know the Sydney funnel web spider is the worlds most dangerous spiders however, since anti venom was introduced in the 80’s, no deaths have been recorded. You can find the Sydney funnel web spider not only on the Northern Beaches but throughout the entire state of NSW. They are commonly found in gardens and bush lands. They are mainly ground dwelling spiders and are not good climbers the male spider who is more venomous will ventures large distances looking for a mate and likes to hide in obscure areas such as under leaf litter , log and rocks also behind man-made structures like retaining walls etc. Due to the fact that male funnel webs wonder onto properties randomly in search of a mate they is extremely difficult if not impossible to treat with traditional chemicals also there exoskeleton has very little to no contact with the ground they simple do not absorb enough of any pesticide treatment to receive a lethal dose due to these facts clean and green pest manager don’t usually treat for them as treatment are largely in effective we also have a great respect for these spiders and understand there great role in our native ecosystem however we will collected them and take them to the Australian reptile park for them to be milked for anti-venom. Make sure that you don’t leave any towels or clothing on the ground outside especially around pool areas. Inspect all door gaps and if needed install proofing strips to prevent access . Red back spiders are commonly found on Sydney’s Northern Beaches and around Australia. Red back spiders may not be as poisonous as the Sydney funnel web spider however they are more commonly found around urban areas and around property throughout Sydney which increases peoples risk of exposure to these spiders while they are very venomous they are fairly easy to locate and treat with a targeted application of insecticide. some of their favourite places to hide are around garage doors, under garbage bin lids , under children’s toys left on the ground mail boxes and even under toilet seats! The last fatal spider bite caused by this spider was only in 2016 were a 22 year old man was bitten on a bush walk in NSW and unfortunately died due to the bite as anti-venom was out of reach. 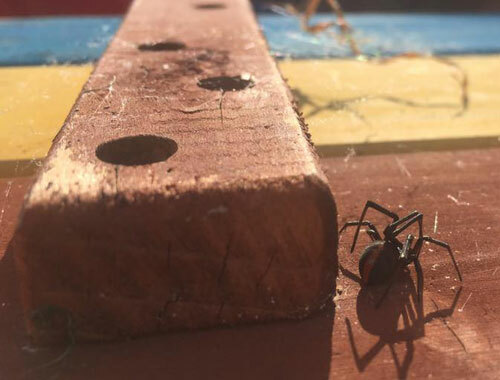 Be aware of possible red back spider harbouring around building materials and bin lids in particular and make sure you don’t put your finger under the lids of bin without first inspecting you could also were gloves to reduce the risk. Mouse spiders are usually found in Sydney’s Northern Beaches and other parts of Sydney. They are mostly found in the bush or in small burrows however sometimes making there was into urban property and back yards. Mouse spiders are considered one of the most venomous spiders in Australia due to there venom being very similar to that of the funnel webs however no deaths have been attributed to these spiders this is probably because they are quiet sedentary spiders that tend to keep to themselves. Managing mouse spiders is very similar to the advice given for funnel webs. MORE INFORMATION : If you have any questions about preventing or removing venomous spiders like the funnel web, red back and mouse spider from your home or workplace, call or text our expert pest controller David Wright on 0477 688 496 for advice. Northern Beaches spider control and removal services. If you have any questions about removing spiders from your home or business premises, contact the team at Clean and Green Pest Management for obligation free advice. We are your local Northern Beaches pest controllers specialising in both traditional and the green pest control methods that are safe for your family and pets. Our licensed pest controllers can advise you on the safest and most sustainable ways to control pests including cockroaches, ants, fleas, silverfish, fleas, rodents, ticks, wasps and bed bug eradication. We can also assist with possum removal and bird control methods. We strive to give you the best experience possible in terms of value for money, explanation and clear communication about how we plan to implement our services and pest control treatments. Click here for a pest removal quote or click the buttons below to get in touch.